We need to revise the Birds Korea Checklist, so that an up-to-date checklist can be included in the Korean language version of Status of Birds which is now under development. Would you like to contribute some of your identification skills, experience and opinions to this process? If so, please just add your comments. Thank you! First, some essential background to the Checklist and then a decades-old identification challenge. The last Checklist version was posted online at the end of April 2014 and was published in September in the English-language Status of Birds, 2014. To avoid repeating information at length here, please read through the category descriptions and status codes. Most importantly for this post, if a claimed national first record is supported by a photograph or sound recording that enables identification then the species should be listed in Category One. If not, then the species should be listed in Category Four or removed from the list. It cannot be stressed strongly enough, this process is not an assessment of the observer who made the record. Instead it helps us to maintain a consistent standard when there is no national committee to assess such records. The Checklist with its species, subspecies and status codes needs constant updating. There are frequent improvements to the IOC Checklist, new breeding records and / or records that signal or require a change in the status of taxa recorded in Korea. These include this week’s Eurasian Bittern Botaurus stellaris in Suncheon, which requires the adding of SV2 (rare in summer with fewer than ten records) to the species’ existing status code. After a week of review, with much valuable help from several people already and a lot of specialist literature, I have found 50+ revisions that I think we need to make. Some are simple revisions to follow IOC name changes, and taxonomic changes affecting subspecies. Others are to do with status codes (as with Eurasian Bittern above) and category allocation. As part of an effort to improve transparency and to benefit from everyone’s expertise, from now I would like to use a series of blog-posts to help build consensus on proposed changes, giving everyone (members or otherwise), a better chance to discuss identification issues and the status of species more publicly. Among several long-standing identification issues that would be great to resolve is the ROK’s only record of Wilson’s Phalarope Phalaropus tricolor from 1996. This record is included in Park (2002), in OSK (2009) and in Park (2014) and most other lists. At present, however, Wilson’s Phalarope is in Category Six of the Birds Korea Checklist. Category Six is a kind of public online file for decisions that are still pending. These are species that have already been listed, one way or another, in other formal checklists or in books on Korean birds. Yet, as far as we know, these species either have no images, sound-recordings or specimens to support them; or they are supported by images that seem ambiguous at best. Should they be included in Category One (if there are images)? Or in Category Four (if a first-record without what we call “adequate documentation”)? Or should they instead be rejected, and removed from the list? Again, this is not to do with the competence or the honesty of the observer(s). It is instead about ensuring that our national checklist can be trusted and used by people 50 years from now, without knowing anything about the observers. Back in 2005, wanting to know more about the Wilson’s Phalarope record, I mailed with Onishi Toshikazu (a well-known birder and bird-book author). He told me that his friend, Kozono Shigeru visited Ulseuk Island in the Nakdong Estuary in Busan on October 22nd 1996. He only had a 300mm lens with him. On this visit to the estuary he found two Wilson’s Phalarope together and took a series of poor images that were then printed in the May 1997 edition of the Japanese-language magazine BIRDER. OT kindly scanned the best images and sent them to Birds Korea. It is quite possible that the images in the magazine itself are much better and clearer than this. The description accompanying the images might also provide key information to confirm the identification as two Wilson’s Phalarope. We do not have that information, however, and we assume that information is also not widely available in Korea because, for example, both Park (2002) and the nation’s best field-guide (Park 2014) indicate there was only one bird. This suggests that the record has probably never been properly “reviewed” by an independent committee, and probably most birders here have not questioned the identification, even though there have been no subsequent records in Korea and even though until 1990 (at least) there had only been two records of this species in Japan: once in May 1985 and once in July 1986, both at the same site. As both probably relate to the same individual (Brazil 1991), it seems that Wilson’s Phalarope really is / was an extremely rare vagrant to East Asia. If we only have these images, should we accept this record as Korea’s first Wilson’s Phalarope? Please share your thoughts. In my opinion we should not. There are several structural features suggested by these images, however, that do not fit well with my impression of Wilson’s Phalarope. Although I have only seen the species a few times, the most striking problem is the bill, especially how it looks in the right-hand image. It looks quite thick at the base, and the bill base also looks much paler and greenish. Wilson’s should have a knitting-needle thin and all-black bill at all ages. The bills of both birds seem to be either about the right length for Wilson’s or a little on the short side (similar to the width of the head). We cannot see the legs. However, although Wilson’s swim well, neither of the birds look to me to be swimming in the images. 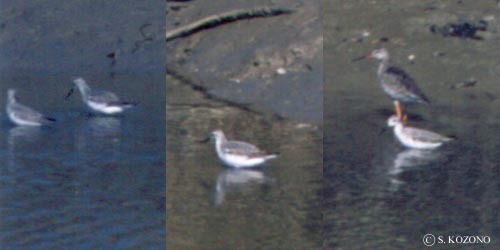 Rather, based on their posture, the reflections in the water, the lack of ripples, and the hint of flank or upper tibia feathering apparent in the middle image, they instead look to be wading in the water up to but not beyond belly depth. As the redshank is standing on a shelving bank, and they are off from the bank, this suggests that either they are long-legged or that they are both somehow wading on a ridge in the water: not behaviour you would expect in a rather short-legged species that swims and walks well. Moreover, when swimming and even when running, Wilson’s seem often to push their thin neck forward. Because they seem to have quite a full abdomen, this often gives a nice smooth curve to the underside of the bird (like a white banana, greyer on top). In all three of these images, however, the neck looks thicker, the head a little heavier, and there is an obvious step from the belly to the abdomen. To me this gives both birds the feel of a ‘shank or calidrid. There is also some unexpected contrast in the plumage. The contrast that we see suggests that both birds should be First-winters. 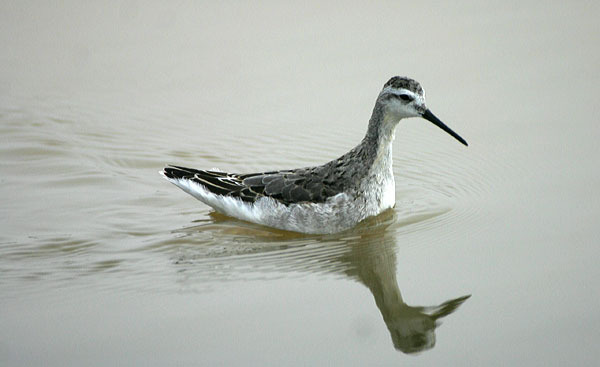 According to Chandler (2009), juvenile Wilson’s Phalarope moult early, so this plumage state is consistent with the identification as Wilson’s. He describes this 1w plumage as follows, “Crown grey; white supercilium, sometimes in front of eye only; upperparts grey with narrow white fringes. Entire underparts white…Retains dark-grey juvenile wing-coverts and perhaps some tertials”. I cannot be sure, but the middle image seems to show a bird with pale grey upperparts that look a little scaley (most likely caused by pale fringes) which contrast with obviously browner-looking coverts, and with the tertials which all look darker, lacking obvious paler fringes. Moreover, most Wilson’s show some dark on the lores (even if just a loral spot). The right image suggests that this bird is white on the lores, with no loral spot. The forehead also really seems to be white, so that the darker on the crown (which looks browner-tinged in the central image) looks more like a cap. To me, this combination is more suggestive of Marsh Sandpiper than a phalarope. Marsh Sandpiper has a total length of 23cm. Its bill length is about one head’s width. Although finer-billed than Common Greenshank, Marsh Sandpiper has a thicker bill than Wilson’s Phalarope and many First Calendar-years show a greenish bill base like the bird in the righthand image. Like most other ‘shanks too, Marsh Sandpiper has a deep belly and slimmer abdomen, so there is often a visible step in the profile of the underside. They are long-legged and feed almost habitually by wading, often belly deep, into the water. They also often associate with other ‘shanks, like Common Redshank. Super-smart in breeding plumage, Marsh Sandpipers in First-winter plumage simply look pale: grey-backed with contrasting browner wing coverts and darker tertials. They have strikingly white foreheads, lacking a dark loral spot, and a darker eye-patch that runs back to the nape. If I had been sent these images without knowing what they were supposed to be, I would have said they were most likely Marsh Sandpiper. This ID is based on structure, behaviour, bare parts patterning, plumage and even what we know of migration strategy. Do you agree, or disagree? Is there still a good reason to identify these birds as Wilson’s Phalarope? Should this species be added to Category One? Or to Category Four? Or should it be removed from our Checklist? OSK. 2009. Checklist of the birds of Korea. Seoul: Ornithological Society of Korea (in Korean). Park J-Y. 2002. Current status and distribution of birds in Korea. Department of Biology, Kyung Hee University, Seoul (unpublished thesis, in Korean). Park J-G. 2014. Identification Guide to Birds of Korea. Checklist of Organisms in Korea 12 (series). Nature and Ecology Publication (in Korean). I had the opportunity to study two small groups of Wilson’s Phalaropes this week (4 and 16 birds) in California, and based on this and many previous experiences, I do not think there are any Wilson’s Phalaropes in these images. As noted in the blog, Wilson’s have a very straight-billed look, and the bill typically looks very thin and very black, lacking the thicker pale base seen here. I do not see anything to conclusively eliminate a Marsh Sandpiper and agree that its large oval-shaped body and small head fit that species better than any similarly-plumaged American shorebirds such as the Stilt Sandpiper or Wilson’s Phalarope. As an aside, committees here often temper their wording to “Not Accepted–identification not established” or some such gentler rhetoric. It seems to have helped a bit. Perhaps combine this wording with Category 4–“Not Accepted; lacking adequate documentation”. Best of luck! Interesting post. Yes, I think Marsh Sp is a safe ID in this case. Nice work. However I would identify the background bird as a Spotted (not Common) Redshank. The legs have an orange that I am used to seeing only on SR (CR are very slightly redder) plus the tibia are proportionately too long for CR. The bill is too long to be CR; this bird is also too long-necked and too tall overall. In SR, the body structure always seems to me to be vaguely godwit-like (as in this individual). CR is more compact. CR would show a neat, bold whitish eyering (visible in even poor photos) and a contrasting brighter, whiter supercilium in front of the eye (not extending behind the eye). Neither are shown by this bird. This individual also shows a well-defined dark eyestripe- a good SR feature. In CR, it is much less perceptible. Also this individual is clean pale greyish on the ear coverts, chin and throat. CR has an overall more evenly darkly-marked face and head in my experience. Yes, there appears to be red on both upper and lower mandibles of the bill, but this is a normal visual effect shown by many SR. In some non-breeding individuals that I have seen photographed, the red does in fact extend onto the upper mandible, in a narrow slither near the bill-base, just below the nostril. In any slightly blurred or unclear image (such as this), the red can be accentuated and will appear to encompass the whole bill base. But we can still make out a hint of the darker edge along the top of the upper mandible. Will be very helpful to receive more comments on the claimed phalaropes, and to learn if there is a clear description of the birds’ legs in the magazine article. I have mailed to a top birder in Japan who sometimes writes for BIRDER magazine in the hope of learning more. In the case of the redshank, it might be a Spotted. That was my original ID of it, because both the tibia and the bill look long, and as you say the bird looks more elegant. If it was a Spotted, which is only a couple of cm longer than Common, then the birds in the water would still be okay for either Wilson’s or Marsh Sandpiper. Structurally, which is usually the best way to go, it looks better for Spotted to me too. I still lean towards Common, however, because I cannot age it if is a Spotted but I can age it if is a Common and there are contrasts there that you would expect of the latter species. If it was a juvenile -> First winter Spotted, should we not see more of a dusky wash on the underparts with trace of barring, more of a specked (hence silery) look to the upperparts and less of a brown tone to the coverts? If it were an adult, and the dark on the upperparts was a genuine plumage feature, then where are the dark splotches on the underparts? If an adult fully in non-breeding plumage (reasonable in late October) and the dark is photographic artefact, then why does the bird not look much greyer above? Where too is the more contrasting head-pattern, with clean white on the supralorals, and clean white extending back as a crisp supercilium above a clean dark eye-stripe? Common Redshank often has some streaking or brown wash across the supraloral area. In this image, this area is clearly less pale than the throat and underparts. This bird looks to me to have a paler throat contrasting with darker breast sides, and paler underparts, that look mottled or speckled. I am still a little troubled by what looks to be a trace of dark eye-stripe behind the eye (looks a little stronger than in most Common Redshank). Contrast-wise though it seems to fit First-winter Common Redshank better than Spotted. The hint of white adjacent to the primaries was what tipped the balance for me, because this would fit well with the underlying secondaries of a Common Redshank and not with Spotted. Common also tend to have more orangey tones to the red than Spotted, a difference that Chandler (2009) also seems to recognise when he describes the legs of 1w (= First non-breeding) and adult non-breeding Spotted Redshank as “red” and of Common Red as “orange-red”. This all suggests to me that the darkness of the upperparts are at least in-part photographic artefact. Is it possible too that there might be other distortions or artefacts in the image? Either way, this redshank challenge only helps to confirm (if it were needed!) that even commoner species can be hard to identify confidently if the image quality is poor!